Although the combustibility of building materials is important in determining levels of safety, the expected response that a building will have in a fire condition is vital to determining equivalent risk, which is fundamental to the IBC. The code classifies structures by type of construction in an effort to account for the expected response that building elements will have in a fire. The IBC defines five main types of construction: Types I, II, III, IV and V. For each, it specifies the materials permitted and minimum fire-resistance ratings associated with the various structural members. ▶ Types I and II construction must only have noncombustible building elements, except as permitted in Section 603. ▶ Type III construction must have noncombustible or fire-retardant-treated wood (FRTW) exterior walls, while combustible or noncombustible materials may be used for interior elements. ▶ Type IV, often called Heavy Timber (HT)construction, has exterior walls made of noncombustible materials, cross laminated timber (CLT) or FRTW, and interior building elements made of solid or laminated timber without concealed spaces. ▶ Type V construction allows the use of both noncombustible and combustible materials in structural elements and exterior and interior walls. Types I, II, III and V construction are further subdivided into two categories (IA and IB, IIA and IIB, IIIA and IIIB, and VA and VB) with the difference being the degree of fire resistance required for various building elements and assemblies. For example, in Type VA construction, all interior and exterior load-bearing walls, floors, roofs and structural members are required to have a minimum 1-hour fire-resistance rating. In Type VB construction, no fire-resistance rating is required. Table 601 of the IBC shows the required fire resistance of building elements (structural frame, walls, floors and rwoofs) for each construction type. Ratings are given in hours. 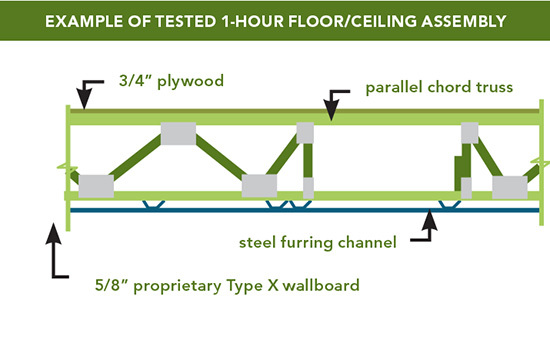 The exception is Type IV, where the wood structural elements are assumed to have inherent fire resistance due to their required minimum dimensions (no fire resistance rating is necessary except for exterior walls). Required fire resistance is based on the expected intensity of a fire that originates within the building as a result of its fire load and the level of risk associated with the size of the building and its occupancy. Fire resistance describes the rate at which a building material or assembly degrades due to a fire. Resistance is based on how rapidly the strength of the member or assembly is affected by the fire and whether the member or assembly can maintain its design strength while preventing the passage of heat or flames. Fire resistance of wood members and assemblies may be established by any one of six means listed in IBC Section 703.3. The most common methods—tested assemblies and calculated fire resistance—are discussed in the following pages. Architect: Lord Aeck Sargent. Photo: Richard Lubrant. 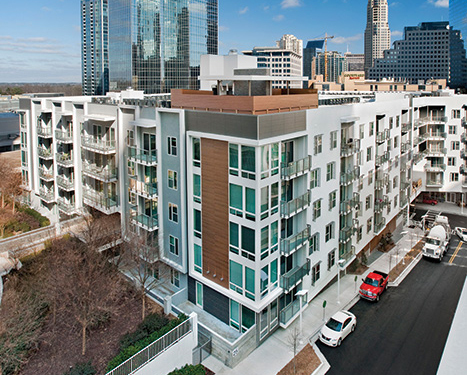 At Crescent Terminus in Atlanta, stairs are designed with double stud walls providing a 2-hour fire separation. The team specified concrete block construction at the elevator shafts, and used a wood-frame wall to separate the elevator shaft from the rest of the construction. They also filled the interstitial space between floors with blown insulation instead of using sprinklers, which avoided technical concerns related to having sprinklers in inaccessible spaces.